While the out to semi-downfacing (pendant) blooms on this fragrant Orienpet Hybrid strongly resemble the old Aurelian variety 'White Henryi' of the 1940's, 'Mister Cas' offers the bonus of the super sturdy stems and heavy substance of the newer Orienpet crosses. This makes 'Mister Cas' an overall a better choice, especially in difficult gardens. 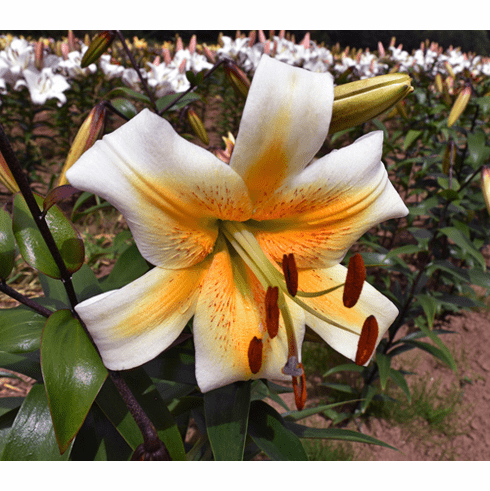 'Mister Cas' sports Golden centers with fine elongated spots in the petal centers. Late July / Early August Flowering. 3 to 4+ feet. Light fragrance.